Like many others, 34-year old Chris Smith is hoping for one more opportunity in the major leagues. He revived his career with an outstanding stint with Sugar Land last season, and recent results give him added hope. 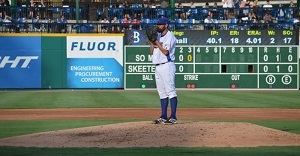 Smith was Pacific Coast League Pitcher of the Week recently for 14 innings of work with San Diego's top minor league team in El Paso, striking out 14 and holding opponents to a .192 average. The onetime Boston and Milwaukee hurler (50 relief appearances from 2008-10) has a team-leading 3.54 earned run average and is starting fulltime now with a 3-5 record and 98 strikeouts in 99.2 innings. "I'm just battling every day and trying to show a lot of mental toughness," the right-hander told The El Paso Times. "I'd love to get one more shot at going up to the big leagues." "He has a variety of pitches and he knows how to use every one of them," added Manager Jamie Quirk. Smith, who was a perfect 6-0 with a 2.15 ERA for 12 appearances (eight starts) at Sugar Land, allowed two runs over seven innings his last time out, and has put together a four-game stretch of 28 innings with seven walks, 29 strikeouts and a 2.25 ERA.